What is one sure-fire way to mess up a financial plan? Try divorce! Well, don't try it, but look at divorce as a bad retirement example. What is one sure-fire way to mess up a financial plan? Divorce! While other financial assets are being chopped up lickety-split, it’s not so fast with DIAs and SPIAs. These irrevocable and guaranteed products are “permanent” and their owners, depending on the contract, enjoy plenty of protections attributable to these contracts’ very simple and unassuming designs. Since billions of dollars in DIAs (thousands of contracts) are being sold annually, let’s look at an IRA DIA where spouses are also joint annuitants. 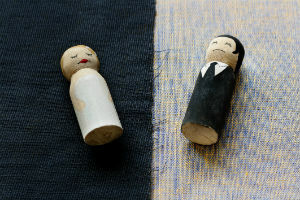 While this is a common contract arrangement while individuals are married, what if divorce occurs? And, to make this example more dramatic actuarially let’s take the classic older man (age 55) younger woman (age 35) case with a Joint 100 percent survivor and life-only contract purchased with marital funds. It’s his IRA and the monthly income is $1,000 starting at his age 65. At the divorce date, breaking down the irrevocable annuity components, and based on current DIA rates, a lifetime income on his life only for this annuity costs about $103,000. However, because he added her to his contract as the joint annuitant to inherit the entire $1,000 monthly lifetime (her) payment at his death, it cost him significant additional premium at the time. Because, she’s 20-years younger, and obviously female, this is a huge benefit. Statistically, she is going to survive by decades. At current DIA rates, this survivor benefit is worth an additional $53,400. Therefore, at the divorce date, the total value is $156,400 ($103,000 + $53,400). As the couple elected to divide their assets equally, her interest is $78,200 ($156,400 x 50 percent), half of the total DIA value. However, she is already getting all the survivor benefits because this is an irrevocable feature of the contract, and he paid the additional premium, that only she can benefit from. If her total interest is $78,200 and she gets all the survivor benefits of $53,400, her interest in the annuity is reduced to $24,800 ($78,200 – $53,400). Dividing the monthly payment, she is only entitled to $159/mp. [($24,800/$156,400) X $1,000]. He is entitled to the payment balance $841 ($1,000 – $159). But, she gets the full $1,000 at his death and since she is so much younger, she will collect this full payment for quite a while. But, the IRA DIA protects his income, while he is still alive and can enjoy it, allowing him to retain most of it on post-divorce property disposition basis. What about that? Interesting? Read on. What if, instead, he owned a cash-value deferred annuity, or a well-diversified investment portfolio, or U.S. Government bonds, or a bank savings account and it had the same $156,400 value as the DIA at divorce, again assuming equal property division? He would only walk away with half $78,200 ($156,200 x 50%) of the cash value. In this case, and for this common risk, because divorce happens every day to everyone rich and poor alike, these alternatives didn’t do much for him. Well perhaps, the alternatives aren’t really all that safe after all. What kinds of investment returns would he need to achieve in order to grow his remaining post-divorce $78,200 to age 65 to support a monthly withdrawal of $841, or $10,092 annually to equal the post-divorce income value the DIA affords? To make this calculation simple, his financial consultant advises him his age 65 annual withdrawal rate, to be safe, should be about 4.00 percent. Given this withdrawal constraint, this now small investment/savings portfolio, after 10 years, would have to accrue to $252,300! Hm, let’s see, what is the annual average growth rate required to grow $78,200 to $252,300 after 10 years? How does 12.42 percent per year grab you! Oh yah, he can get that guaranteed, no problem. At the time of divorce, his investment/savings portfolio value, now significantly damaged, will always and forever be, diminished relative to the DIA guaranteed contract value, because the DIA is able to produce more income on a guaranteed basis in a post-divorce property division world. And I know many people divorced more than once and you probably do, too. Talk about really hammering a retirement plan! Want to do your clients a big favor? Sell them some “life happens” insurance not just only investments. Because DIAs and SPIAs are insurance products, they help clients maintain their retirement plan trajectories when worlds collide. That’s the idea; always keep your hands up!